Aviation Week & Space Technology and its staff have named Dr. Mark Lewis (AE) as one of their 2007 Laureate Nominees. 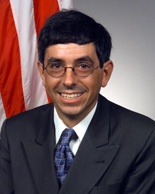 Dr. Lewis is Chief Scientist of the U.S. Air Force, Washington, D.C. He serves as chief scientific adviser to the Chief of Staff and Secretary of the Air Force, and provides assessments on a wide range of scientific and technical issues affecting the Air Force mission. He is currently on leave from his position as Professor in the Clark School of Engineering's Department of Aerospace Engineering, and as Director of its Space Vehicles Technology Institute. This international award was conceived nearly 50 years ago to honor select individuals and teams who make significant contributions to aviation and aerospace. Honorees are nominated by the magazine's editors in one of eight categories. Dr. Lewis' nomination was based on his contribution in the field of Aeronautics/Propulsion. There are no more than five candidates in each category, and the full list will be published in the Jan. 1, 2007 issue of the magazine. Dr. Lewis will be honored at Aviation Week's 2007 awards dinner, where the Laureate winners will be announced. "Laureates' accomplishments are a testament to the spirit, courage and passion that drive the global aviation and aerospace communities," states Anthony L. Velocci, Jr., Editor-in-Chief of Aviation Week, "and we look forward to sharing with the rest of the world the names of these men and women." The Laureate Awards formal dinner will be held on Tuesday, March 20, 2007 at the Smithsonian Institution National Air and Space Museum's Steven F. Udvar-Hazy Center outside of Washington, D.C.